Buy 12mm Laminate Flooring at Discount Prices! When quality matters, why not choose the best? 12mm Laminate Flooring is the best quality option if you’re looking for new flooring for your home or business. Portland Flooring & Carpet of Oregon City is the best place to buy 12mm Laminate Flooring. The strongest and sturdiest laminate flooring are those that come with a thickness of 12mm. For outstanding wear, and durability, 12mm laminate flooring is the smartest laminate flooring option. Commercial spaces of all types, including hospitals, schools, and retail stores will all make good use of flooring that is 12mm thick. 12mm laminate flooring is a great option for most Kitchens, Family Rooms, Rec Rooms, and Entry Ways. 12mm Laminate flooring offers superior sound deadening quality. In general, laminate flooring is less sound absorbent than actual hardwood flooring. This is one reason that 12mm laminate floors are ideal. The extra thickness of the boards helps absorb the sounds of footsteps and ambient sounds in the room. Many of our 12mm laminate flooring selections in our Invincible line come with an additional pad attached. While the pad underlayments are optional they also contribute to the sound absorbency of the floor. 12mm laminate flooring are extra thick (nearly ½”), extra durable, and extra sound absorbent more accurately replicating the sound of actual hardwood floors. Which areas are ideal for 12mm laminate flooring in your Oregon City home? High traffic areas are ideal for 12mm laminate flooring. 12mm laminate floors are meant to be walked on and used! They are designed for lots of activity, while offering the look and feel of natural wood. The beauty of laminate flooring that is 12mm thick is the fact that the colors, style, and designs are all top notch. You get style and durability all in one, nice package. What’s the best Oregon City Carpet store for purchasing 12mm laminate flooring? Which Oregon City flooring store can accurately be described as Oregon City’s Laminate Flooring Outlet? The answer is Portland Flooring & Carpet of Oregon City. 12mm Laminate flooring is generally the thickest laminate flooring sold in most markets. At Portland Flooring & Carpet of Oregon City we carry about 30 selections of the best selling colors and wood flooring simulation types starting at just $1.99 sq ft which in some cases includes the pad. These selections can be viewed online in our 12mm laminate flooring section on our website or view them in person at our Portland Laminate Flooring Outlet Store at 3452 NW Yeon Ave in Portland, Or. We carry multiple finishes of 12mm laminate floors including hand scraped, natural finish and gloss finish. Some come with pad attached or choose from multiple alternative underlayment options The thicker 12mm laminate flooring boards allow for deeper embossing and special design textures often not possible with 7mm and generally thinner laminate flooring selections. Whether you’re looking for the quality of a 12mm laminate floor or you’re more budget conscious and opt for inexpensive 7mm laminate flooring, we’ve got your bases covered! 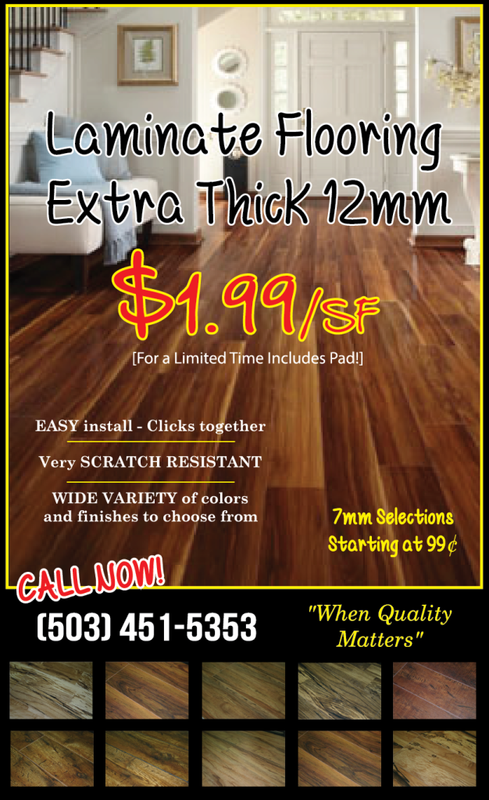 Portland Flooring & Carpet of Oregon City sells both 7mm and 12mm laminate flooring at cheap discount store prices. We have low prices everyday! Buy your laminate flooring direct from your locally owned Carpet store and save money. At Portland Flooring & Carpet of Oregon City we carry most major brands of flooring. Our 12mm laminate flooring collection performs excellently in high traffic areas. It is an excellent choice for anyone looking for a robust and durable surface. Whether you are a do-it-yourselfer or would like to sit back while we do the installation for you, call us today at (503)451-5353, visit our showroom at 3452 NW Yeon Ave in Portland,or fill out our online form to schedule an estimate with one of our design consultants. On Sale Now. 12mm Laminate Flooring Sale. Browse our Selections Online, then call (503)451-5353 to speak with a sales consultant today.